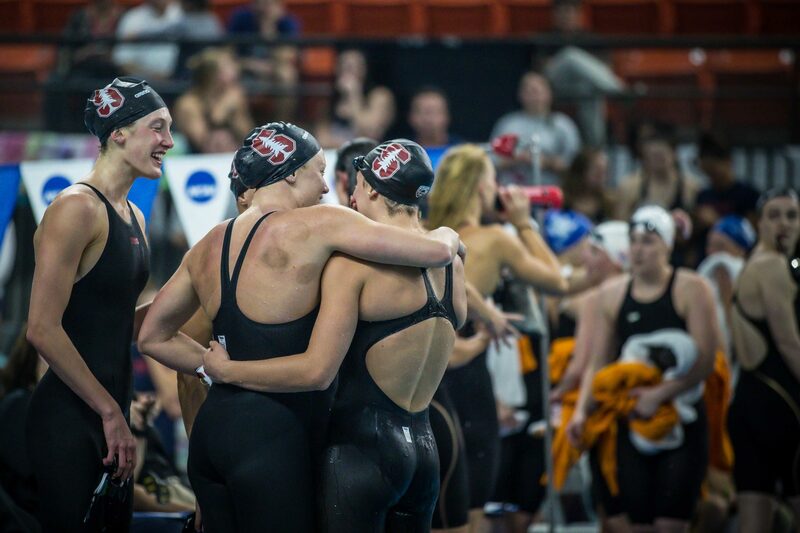 The Stanford Cardinal picked up their first event win of the 2019 Women’s Division I NCAA Championships Wednesday night, throwing down a new pool record in 6:47.22. Katie Drabot led off in 1:43.99, followed by Ella Eastin with a stellar 1:41.03, then Taylor Ruck – in her first NCAA Championship swim – broke the race open in a blazing fast 1:39.83, and Brooke Forde anchored in 1:42.37. However, Forde’s time was “to the foot,” as she accidentally tacked an extra 50 onto the end of her swim. Luckily, she was anchoring and Stanford had a multi-second lead, so it didn’t affect the race outcome. Impressively, however, Forde’s best time in a (flat start) 200 freestyle is 1:44.68, and her relay split last year was 1:42.94. Even with the relay start, the fact that she was over two seconds under her best time – to the foot – bodes well for her performance this week. Her splits were 24.06/25.35/25.94/27.02/27.58 (the final one being from our watch). “I’d like to say it was a victory lap,” Forde said in a post-race interview. The team laughed it off right away – we’ve all been there, or at least been nervous about being there. If she wasn’t the last in the team and someone has to take off after her then what this girl should do in such situation: to jump risking a collision and maybe serious injuries or to stop racing. Probably she shouldn’t start because her team will be DQed anyway. But the decision should be made in the fraction of a second. Not easy. If she wasn’t last she would have seen a teammate ready to jump in the pool. With the eyes on *top* of her head? I don’t know which is more amazing… Stanford still winning or a Stanford student not knowing how to count to 8! NotSwimSwam said it first, folks! 27.3 last 50 for Forde. Must have slowed down a bit when she realized what happened… but still finished like a champ!